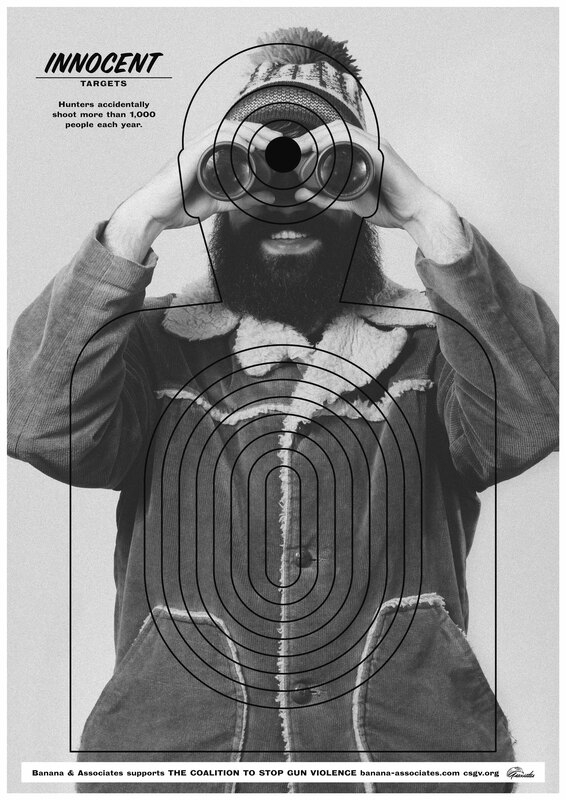 Innocent Targets is a series of shooting range posters depicting the countless number of innocent victims killed by guns in America each year. but rather our real-life friends, neighbors, co-workers and children. – Americans own 70 million dogs and 270 million guns. – Twice as many women are shot by their husbands than by strangers. – There are roughly 60,000 pizzerias in America and 120,000 gun dealerships. Innocent Targets is a reminder of the thousands of lives lost to the deadly gun culture in America and a call-to-action to help us put an end to it. The posters in this series are available for purchase at www.innocent-targets.com, with proceeds going to The Coalition To Stop Gun Violence. Innocent Targets is a project by Banana and Associates, a creative studio led by international creative directors Ewoudt Boonstra and Zack McDonald. The posters were designed by acclaimed graphic artist Anthony Burrill with photography by Robbie Augspurger.